The rigidity of the antiparallel double crossover molecule has allowed us to use it as a component of a DNA nanomechanical device. The device works by utilizing the B-Z transition of DNA. 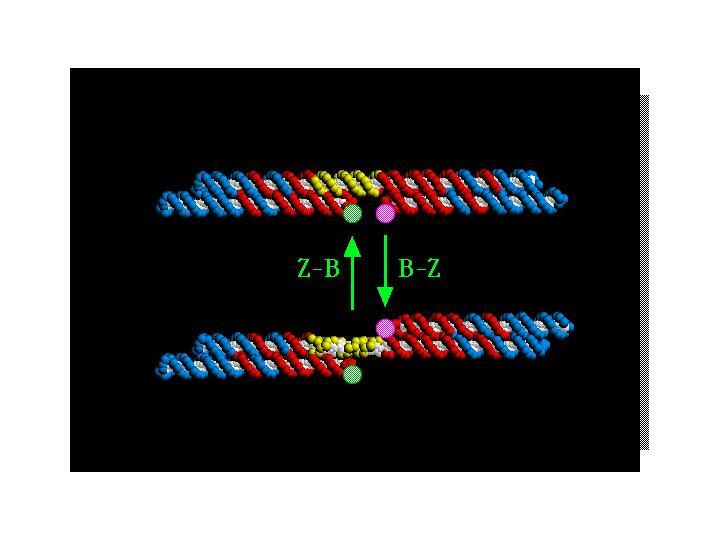 We have connected two double crossover molecules (red and blue regions below) by a bridge segment that contains a region that can be converted from right-handed B-DNA to left-handed Z-DNA. This convertible segment is shown below in yellow below. In the upper portion of the drawing, the connecting bridge is in the B conformation, so the two helices of the double crossover segments are on the same side of the helix containing the bridge. In the lower portion, the bridge is in the Z conformation, so the helices are on opposide sides of the helix. The change from B-DNA to Z-DNA is caused by the addition of Hexaamminecobalt(III) chloride to the solution. The change back is caused by removal of this reagent. The two large stippled circles represent fluorescent dyes attached to the device. The change of conformation from B-DNA to Z-DNA is monitored by fluorescence resonance energy transfer (FRET) spectroscopy involving these two dyes.